From car tyres to elastic bands, rubber is everywhere. The elastic polymer that bounces back when stretched has a million applications. The big drawback is that you can’t recycle the stuff. So old rubber tires are condemned to weigh down tarpaulins or be burnt. Martin van Duin would like to change this. He works at synthetic rubber producer Lanxess and has been appointed Honorary Professor of Rubber Products at the University of Groningen. In a circular economy, discarded products are recycled. This makes product design and development a challenge, but recycling is sometimes an even greater one. Take rubber, for example. Before both natural and synthetic rubber can be used, they need to undergo a process known as crosslinking or vulcanization. In this process a curative such as sulphur or peroxide is added. This forms sulphur-carbon or carbon-carbon bonds (the crosslinks) that join the long polymer chains in the rubber. The only problem is that the process is irreversible: it is possible to break the crosslinks, but only at temperatures that would also degrade the main polymer chains. ‘It is the crosslinking that makes rubber elastic’, explains Van Duin. Rubber polymers are crosslinked on roughly one in every 300 carbon atoms. Much research has gone into finding a way to reverse the crosslinking without destroying the polymer. 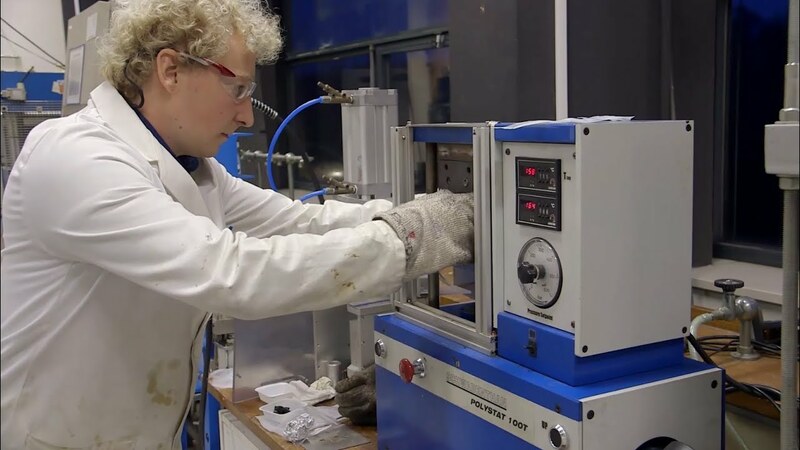 At the University of Groningen, Franchesco Picchioni’s Product Technology group, part of the Engineering and Technology Institute Groningen recently explored the use of ‘devulcanizing’ agents in a continuous extrusion process. ‘I have collaborated with Martin van Duin in the past, and this has now been formalized by his appointment as honorary professor’, says Picchioni. One project they will tackle together is to try and make a thermo-reversibly crosslinked rubber, in which the crosslinks can be broken at moderate temperatures. ‘We have already made thermoplastic polymers that can be thermo-reversibly crosslinked’, Picchioni explains. ‘But those were not rubber polymers. So we need new chemistry.’ If they succeed, it will be possible to recycle rubber. Van Duin has worked in polymer chemistry for most of his career, and rubber has been his prime interest for about 15 years. ‘I worked as a scientist in the rubber division of the chemical company DSM in Geleen. A couple of years ago, this division was divested to Lanxess, the largest producer of synthetic rubbers.’ So he now works for Lanxess in a job that he describes as ‘rather academic’. Van Duin and Picchioni will work together to initiate research projects and secure funding. They will devote the next couple of months to some serious brainstorming, not only on rubber recycling, but also on greener feedstock for rubbers. What Van Duin likes best about research is solving ‘chemical puzzles’. ‘At Lanxess, my role is to challenge people to come up with novel solutions. So I really need to be on top of the scientific literature.’ At the University of Groningen, his modest 0.1 FTE appointment means his role is supportive. ‘But we expect to establish a sub-group in rubber products’, says Picchioni. Last modified: 05 December 2017 11.34 a.m.